I wake up, get some fresh pastries and baguettes, eat breakfast, and make the day’s sandwiches. It’s another beautiful clear morning, and I’m eager to get out there. If anyone tells you that traveling in Paris is necessarily expensive, don’t believe ’em. 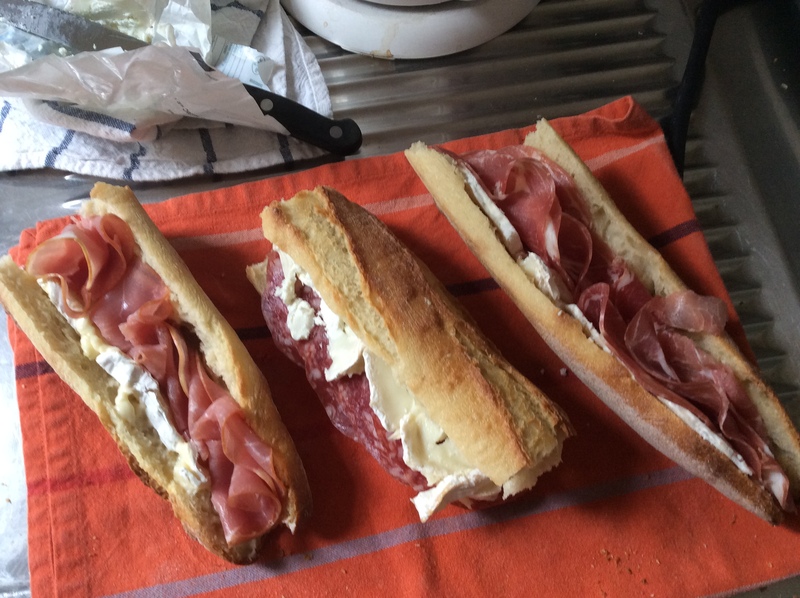 You can make delicious sandwiches with charcuterie and cheese that cost less than about $1-2 euros each in ingredients, fresh baked breads and basic pastries are super cheap, sightseeing is free and so is the entertainment if you know where to look. Take a tall can of beer or a bottle of wine to the left bank of the Seine, near the sculpture garden, and watch the dancers in the evening, even join in if you’re more talented than I; watch the acrobatic street performers on the Pont au Double bridge to the Île de la Cité; let your ears guide you to the many talented street musicians to be found near every bridge and in many other public places. If you’re sick of sandwiches, pastries, and fruit, I found one grocery store (turns out, it’s a chain) that sells nothing but frozen foods: delicious and well-prepared meals that are much, much cheaper than going out. And Airbnb has done wonders for making inexpensive but comfortable travel accessible to just about anyone. So you can easily be frugal and have a great time, saving your money to spend on the really amazing things to do here, like going inside the Pantheon or splurging on a fine meal (rue Cler is the place to go for this: excellent food while not overpriced). Before I tell the tale of my day’s adventures, let me start with a site I stop by on the morning of Aug 11th that I’ve forgotten to mention. 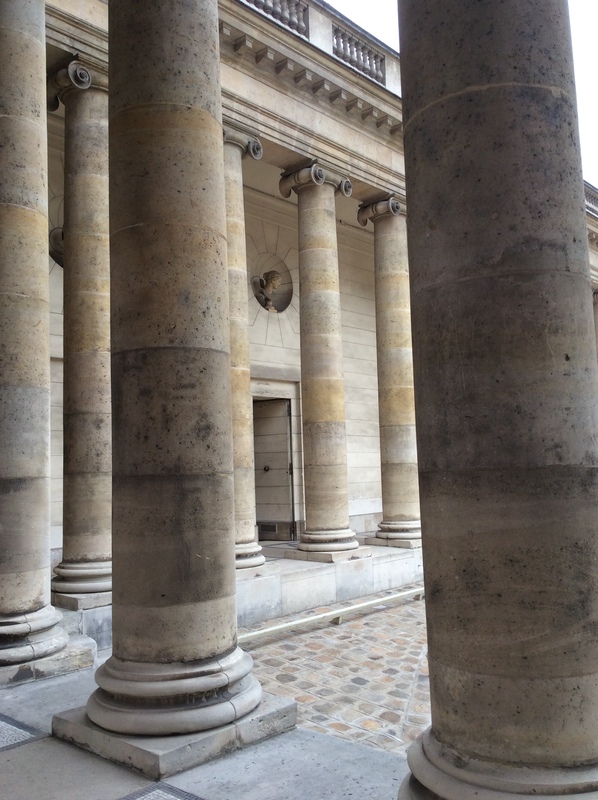 I had a little window of time before I was due at Gare du Nord to meet my husband and head off to Berlin for a few days’ detour to visit family, so I was able to visit just one place associated with my traveling philosophy adventures. So from my little cubbyhole apartment on Boulevard Voltaire, I head down Boulevard Richard Lenoir, a lovely wide street with a shady tree-lined park running down the center, where I find a fresh-faced grandmother playing ping pong with her young charge on one of the outdoor tables. What a great way to start the day! 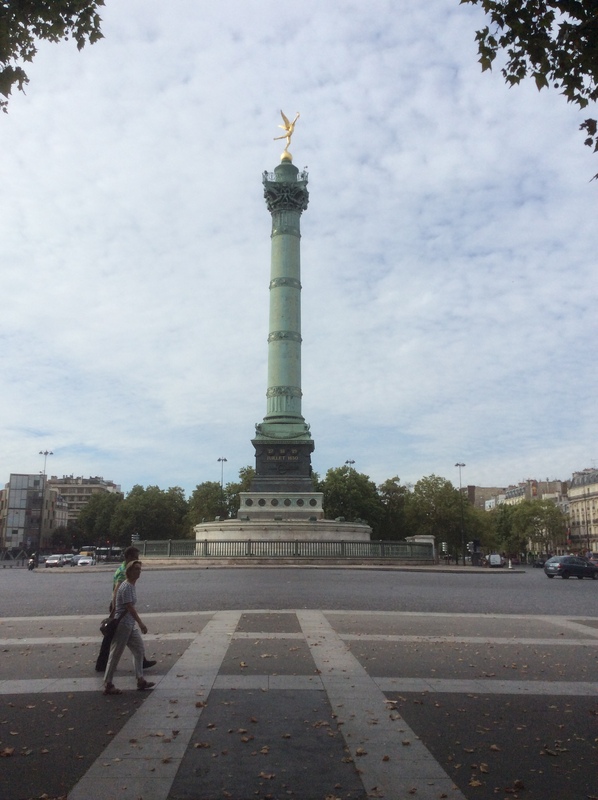 I’m heading for the Place de la Bastille, the site where the notorious prison once stood, which by the late 1700’s had become a symbol of unchecked monarchial, aristocratic, and clerical power. When it was stormed by an angry mob of working people of the professional class and soldiers who were sent to quell the uprising but joined it instead, the Revolution was understood to have begun in earnest. July 14th, 1789, is celebrated to this day as the pivotal juncture on the road to French liberty. The day before it happened, Thomas Jefferson wrote to Thomas Paine of the impending political storm that was about to break any moment, given public outrage over the King’s perceived disdain for the will of the people as embodied in the National Assembly and the popular unrest that was already raging throughout the city. When King Louis XVI observed how violently unhappy his people had become under the established system of government, he took steps to regain their confidence and to show them he was dedicated to reform. He appointed the marquis de Lafayette, a great favorite of the people, as Commander of the National Guard. Lafayette immediately proceeded to organize the full demolition of the Bastille, which the crowd had already begun. 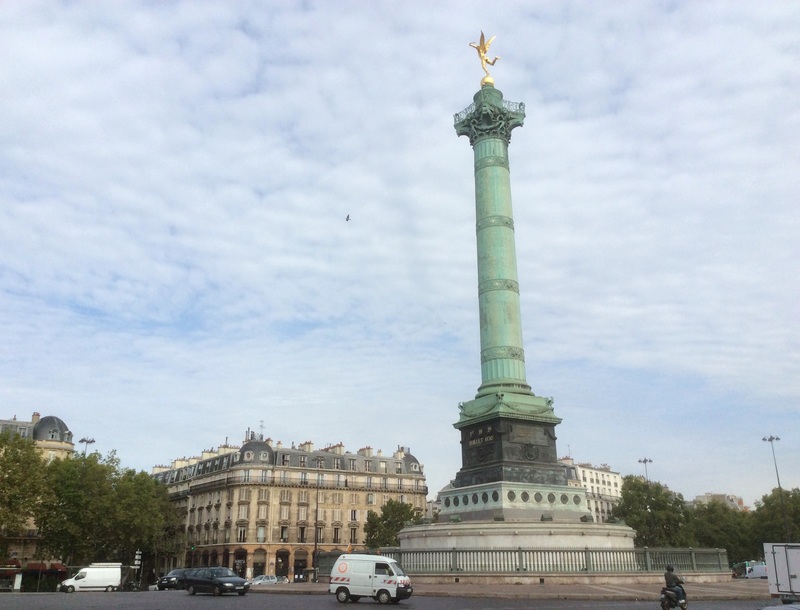 He entrusted Paine with the mission of delivering the key of the Bastille as a gift to Washington, a symbol of the French unity with America in their commitment to democratic rule. Given the unrest in Paris and the enmity between the British, French, and American navies (it was the persistence of the British practice of forcefully boarding American ships and impressing sailors into British service that led, in part, to the War of 1812), it took awhile for Paine to get it delivered to the United States. He was ultimately successful, and key of the Bastille resides at Mount Vernon to this day. So now back to August 18th’s adventures. 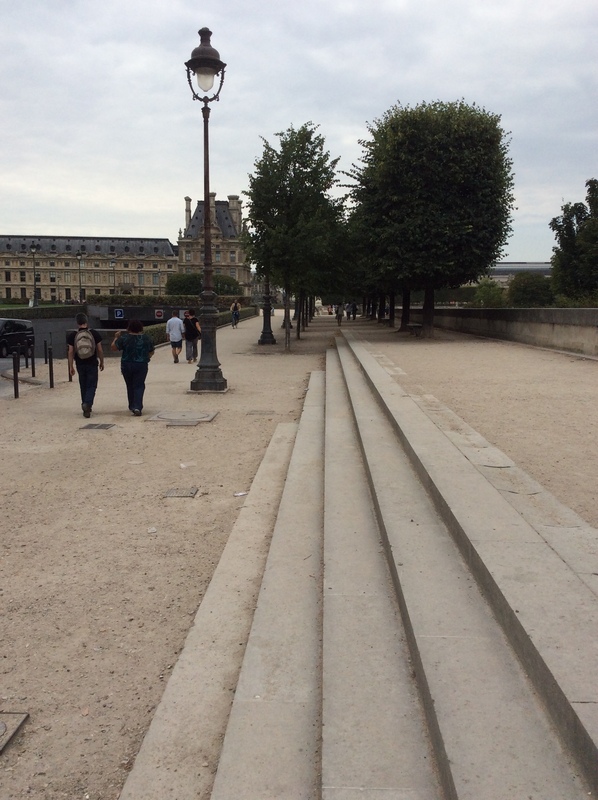 I zigzag my way from rue Montmartre to my first destination of the day: the site of the Tuileries Palace. 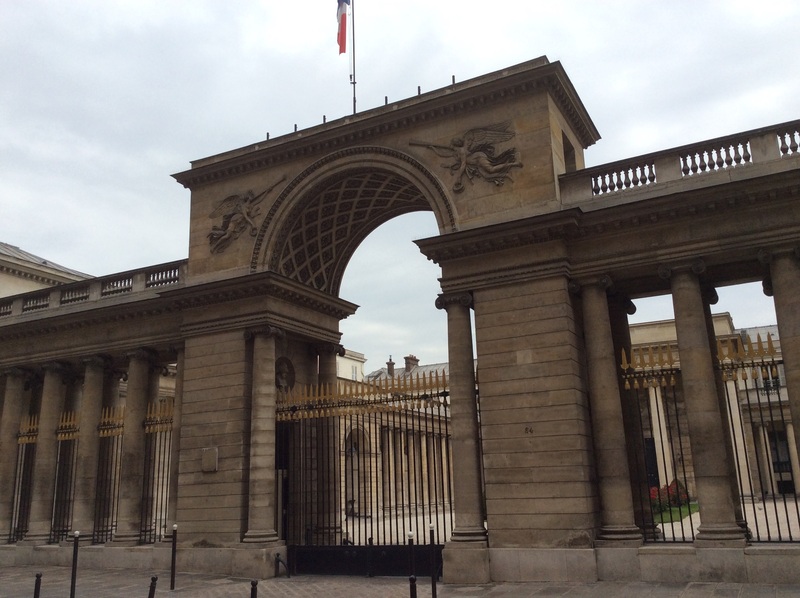 From May of 1793, the Convention, or the French revolutionary government, met at Palais Tuileries. Here, Thomas Paine called for leniency for the royal family, arguing as forcefully as he could that the Revolutionary government’s show of mercy would be an inspiration to the world, setting itself apart from centuries of European bloodshed in the pursuit of power, and also show its commitment to progressive Enlightenment principles. 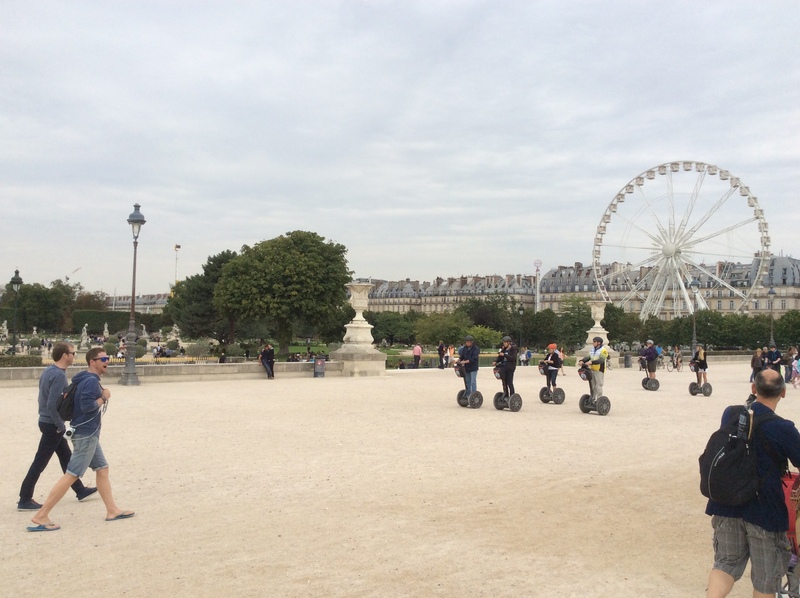 The Tuileries had, by this time, become a dark and neglected palace since King Louis XIV moved the monarchy out of the city to Versailles. Paine’s arguments did no good. On October 6th, 1789, the King and Queen were forced by the Women’s March to move back to the Tuileries so they could be more accountable to the people of Paris and the nation. Versailles was seen as a symbol of a corrupt and wealthy monarchy that had set itself apart from its subjects, collecting taxes and imposing the royal will without sufficient regard for the overall rights and well-being of its people. Most of this was mostly true, although King Louis XVI conducted himself better in these respects than most of his predecessors; he showed himself ready and willing to make substantial reforms, and anxious to see his people happy. 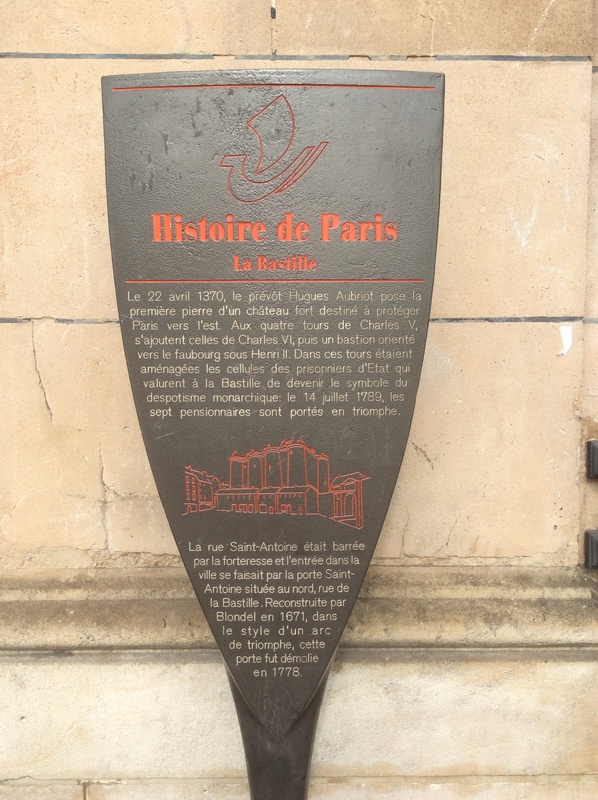 Unfortunately, Louis’s attempts to make things right did not succeed, and he was guillotined on Monday, January 21st at what’s now known as the Place de la Concorde nearby, where Mary Wollstonecraft slipped on the blood of executed victims of the Terror that summer. 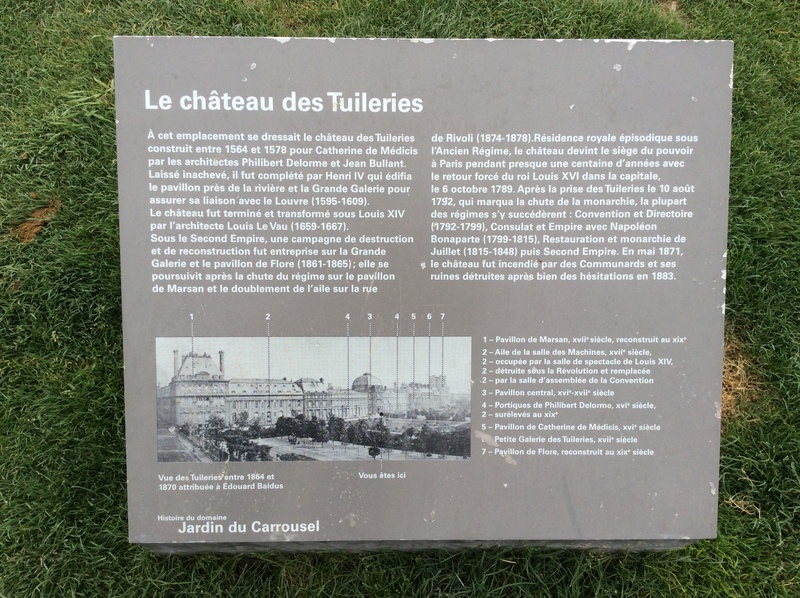 The Tuileries palace no longer stands: it was destroyed in 1871 in a subsequent revolution as an ancient symbol of monarchy and oppression. A long raised terrace all what remains of the palace site, situated between the Louvre, which was also almost destroyed at the same time the Tuileries palace was, and the Tuileries gardens, preserved as a beautiful public space open to all. Paine would approve: he was a committed populist, and often got in more trouble for his insistence on disseminating his views to the public as widely as possible by writing in concise, direct, and accessible prose and forgoing profit to make his books affordable, than he did for the ideas themselves. Meritocrats, big-government proponents, and monarchist sympathizers such as John Adams, for example, considered Paine little more than a rabble-rouser. My second destination for the day stands near the Left Bank of the Seine. The Hôtel de Salm stands facing the quai Anatole France on the river side, and facing 64 rue de Lille, formerly named the rue Bourbon, on the other. Built in 1987 during Thomas Jefferson’s sojourn in Paris, it was one of the buildings which most inspired his design for Monticello. 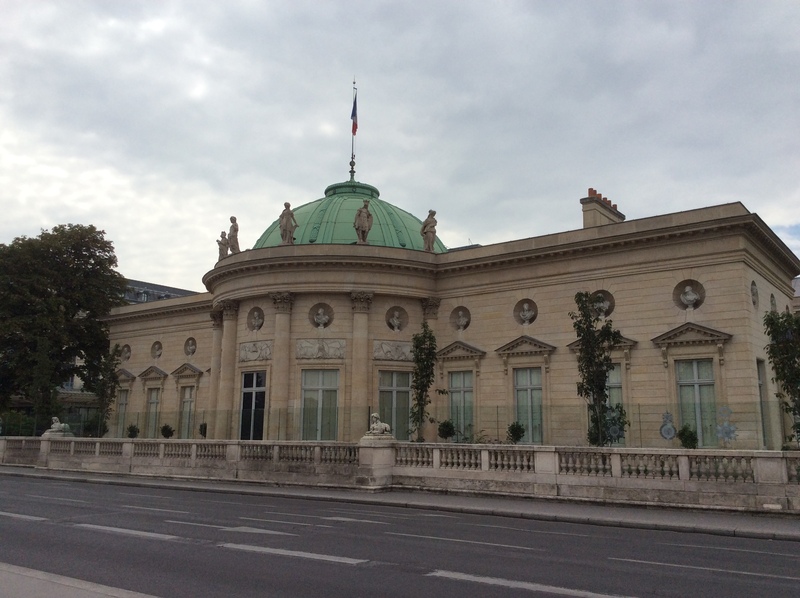 Originally a private home, it’s now the headquarters of the Legion of Honor. It’s a beautiful building, and I especially share his enthusiasm for this one; as he put it, he was ‘violently smitten’ with it. 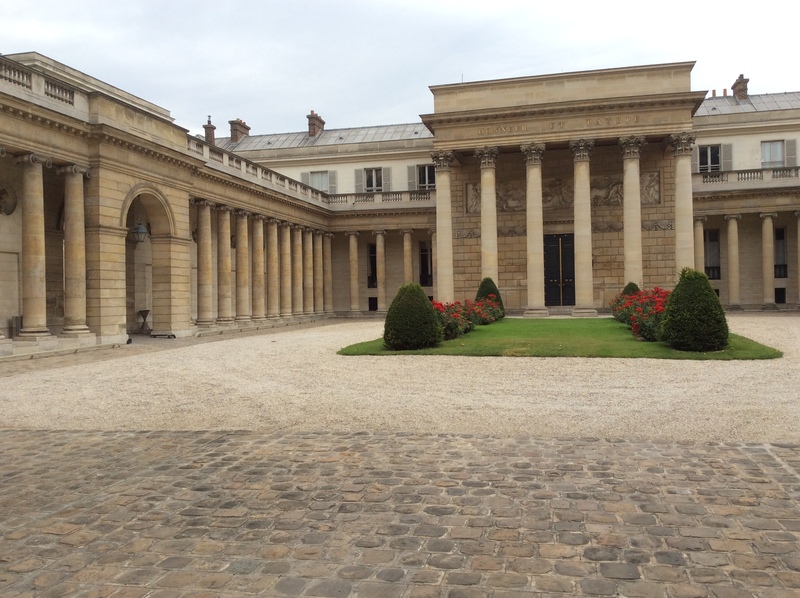 It’s much more welcoming than the imposing colonnade of the Louvre, especially the front entrance on rue de Lille (see the first two photos). It’s inspiring in its beauty and classical style yet friendly, more of and for the people, so to speak, meant more to welcome than to impress or intimidate. 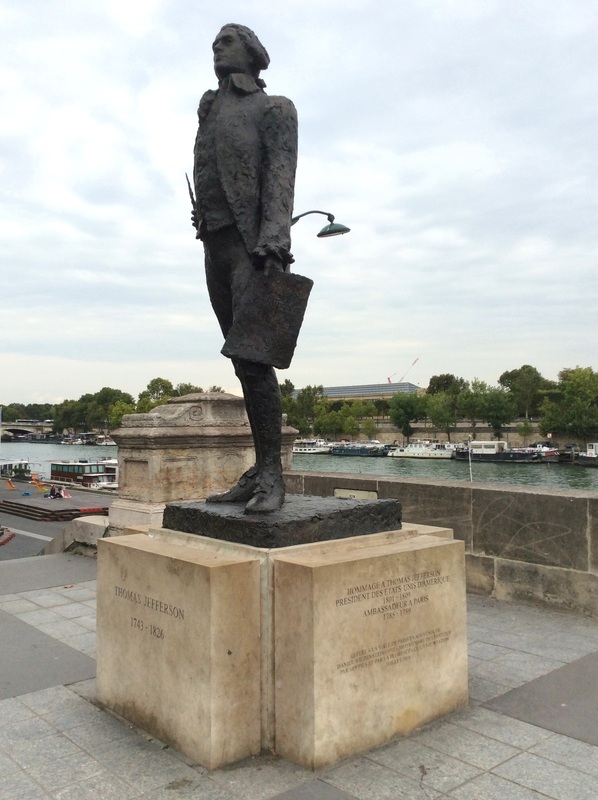 As I round the building to take in all of its aspects, I see that the statue of Thomas Jefferson I had passed by on my first day in Paris stands kitty-corner from the Salm, at quai Anatole France and rue de Solferino at the foot of the Pont (bridge) de Solferino. 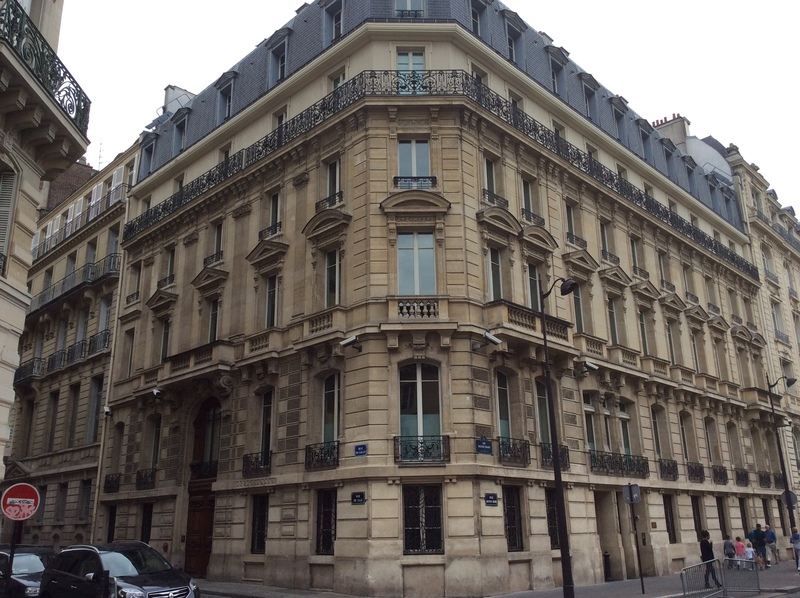 The next site I seek is much farther west on rue de Lille, formerly rue de Bourbon, number 123 in the 7th Arrondissement. Again with this address, at the time of my visit I haven’t found confirmation whether this number is the modern day address or the address at the time. 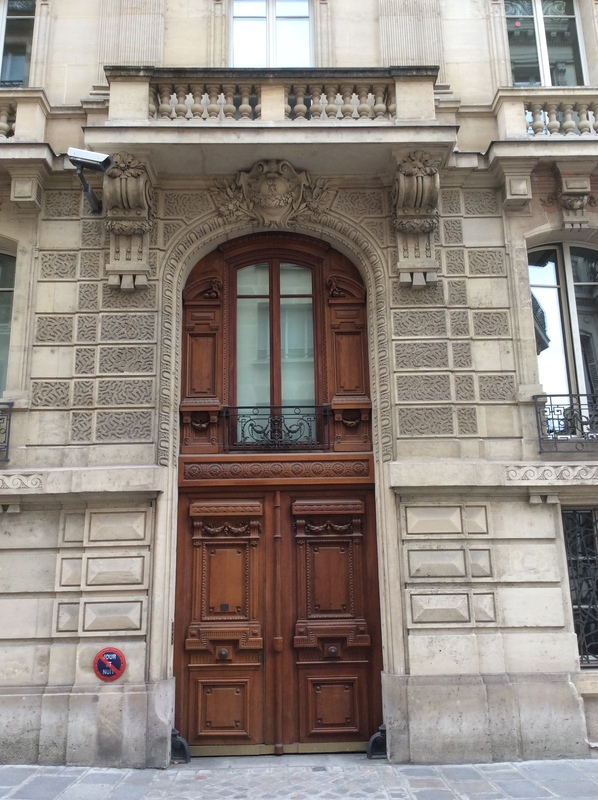 In any case, I’m looking for the marquis de la Fayette’s Paris house, where Thomas Paine lived for much of 1791 working on French edition of The Rights of Man. He had returned to Paris the previous fall to celebrate his being elected an honorary French citizen in recognition of his defense of human rights. Later in that same fall, in early November of 1790, Edmund Burke’s Reflection on the Revolution in France was published. It was a scathing indictment of the extremist and anti-traditionalist nature of the French Revolution, and predicted it would end in disaster, in bloodshed and in even greater tyranny as a ruthless dictator would be sure to seize power amidst the ruins. As history has revealed, Burke was actually correct in his predictions in the short term. But the Terror had not yet begun, and Mary Wollstonecraft and Paine both offered impassioned arguments against Burke’s positions on the nature of legitimate governmental authority and the possibility of instituting a new order based on reason. Wollstonecraft got to it first with her Vindication of the Rights of Men, published less than a month after Burke’s treatise, and it quickly became a bestseller. Paine had his Rights of Man published the next spring, also by Wollstonecraft’s publisher Joseph Johnson, in London on February 22nd, 1791. Almost immediately after its first printing, Paine left for Paris to work on the French edition, and the second, bargain-priced printing in London, released March 13th, really made the book take off. It made him a more celebrated author than ever as well as, more than ever, an enemy of the British crown, especially after Paine released the second part in 1792. William Pitt, the minister of Great Britain, unleashed a public campaign against Paine, just as he did against the French Revolution, and Paine was forced to flee the British isles for good in September 1792, returning to France, his new home country, until 1802. I can’t find any indication on the building before me, 123 rue de Lille, that it once belonged to Lafayette. I’m certain that this is the right street, though, based on more than one source, so as I walk back, I look carefully for plaques that might indicate that his house was elsewhere on this street. 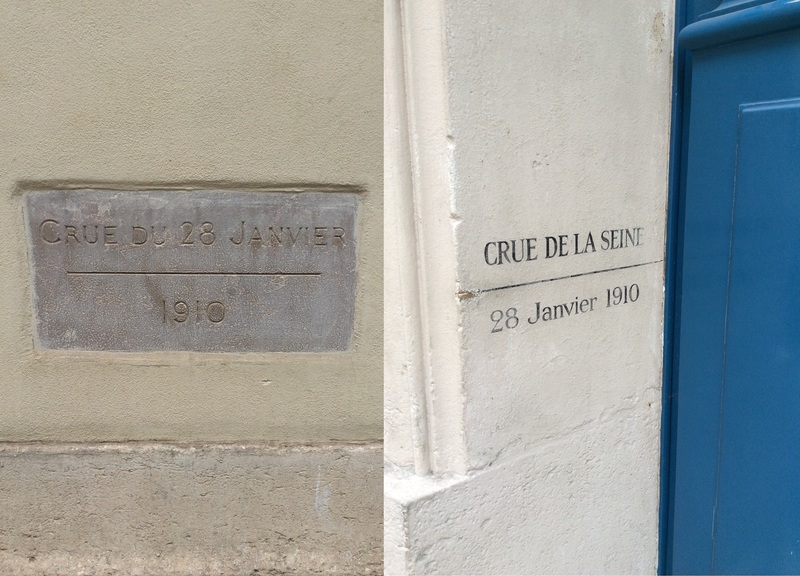 I don’t find such a plaque, but I do see many buildings marked with a line and the text ‘Crue du 28 Janvier, 1910’ with a line. I remember that, a few days previously, I had seen the corner of a small building on the Seine walkway, right down by the water, marked with a series of dated lines. It appears there was a severe flood in 1910, and a series of pretty bad ones over the last century or so. I return to my apartment to gather some things: I’ll be spending the night in Saint Quentin en Yvellines to greet my husband as he finishes his epic bike ride. Since it’s on my way back, I swing by the Passage des Petites Pères to see if there’s anything I missed when looking for White’s Hotel, the hangout for American expatriates that Wollstonecraft and Paine frequented and where Paine lived intermittently. 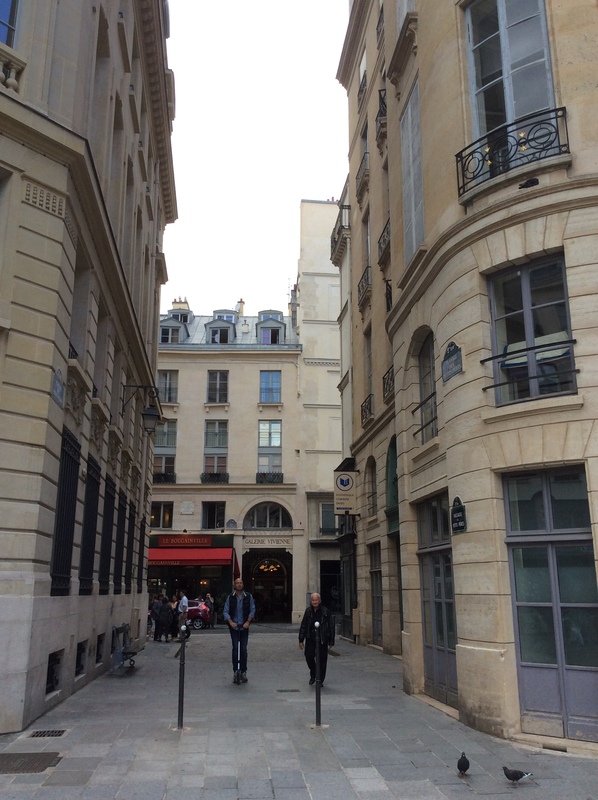 It still seems likely that the building that houses the Galerie Vivienne is the former White’s Hotel, but Hotel de Normandie is a candidate as well, in its location on the left side of the Passage where the odd numbers are assigned. ‘Hôtel de Salm, Palace of the Legion of Honor‘, Grand Chancellor of the Legion of Honor website. Jenkinson, Clay. ‘The Magna Carta‘. 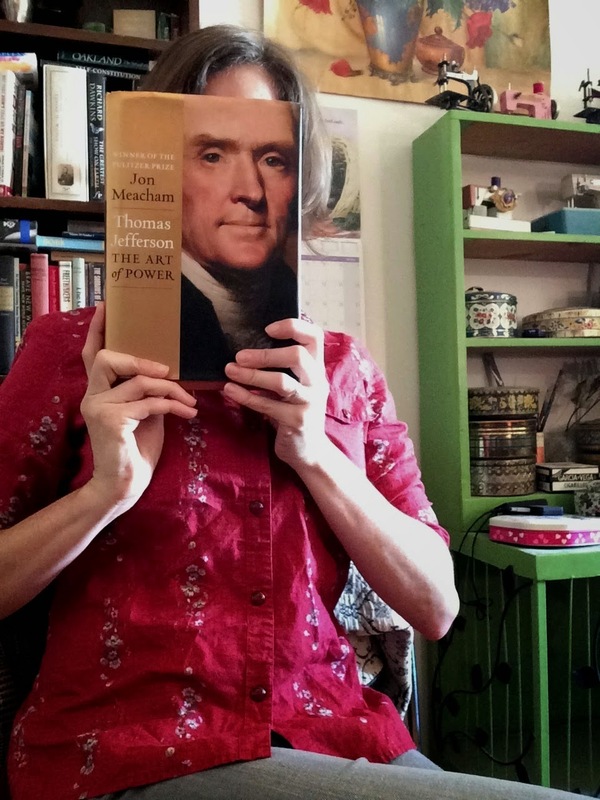 The Thomas Jefferson Hour podcast, episode 1141.